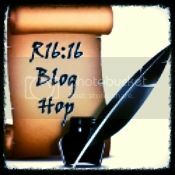 Today I am participating in the R16:16 Blog Hop! Our theme is 1 Thessalonians 5:11–“Therefore encourage one another and build each other up, just as in fact you are doing.” I want to share with you ways to use Scripture as an encouragement in your quilts. The first quilt that came to mind was this one, made for our preacher’s daughter on the occasion of her marriage. I had all her friends (and her and the groom) give me their favorite Bible verse. I printed these on transfer paper, and ironed them onto white muslin squares. I then hand wrote the friend’s name by the verse they had contributed. It turned out quite well, and I’m certain she found encouragement in those scriptures and the love of her friends, especially when they moved far away. My friend passed away from cancer all too soon, and it is my prayer that this scripture was of encouragement to her in those dark days. Use the gifts God has given you, and share his Word with others! They will be encouraged, and you will be blessed. This entry was posted in commentary, medium size quilts, quilts by Quilter Mom. Bookmark the permalink. Great way to encourage others in the scriptures. Thanks for linking up with the R16:16 blog hop. The quilts are a really nice idea. I am sure they are appreciated! Visiting from R16:16. Thanks for sharing.